Vodafone Fiji 7s team lanky forward, Jasa Veremalua has been crowned the DHL Impact Player of the 2015‑16 7s series. 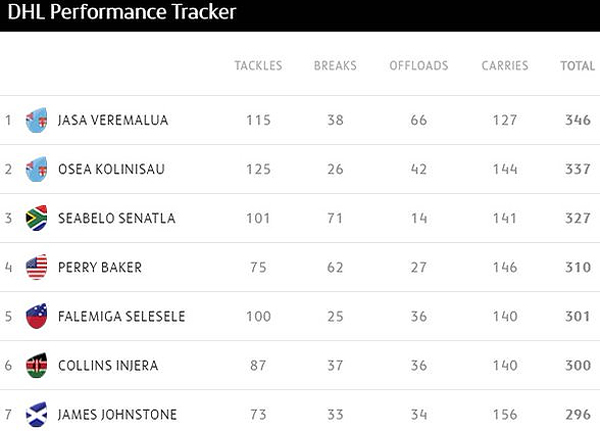 Veremalua scored 29 tries this season, made 40 clean breaks and accumulated 145 points. He also made 135 successful runs this season. He received the award for delivering the greatest impact over the World 7s series this morning. Jasa Veremalua and captain Osea Kolinisau were named in the overall World Sevens Series Dream Team. They are joined by Samoa skipper Faalemiga Selesele, South African duo Kwagga Smith and Seabelo Senatla, Perry Baker from the USA and Fiji born French flyer Virimi Vakatawa. The HSBC World Rugby Sevens Series Rookie of the Year is Australia’s, Henry Hutchison. South African speedster, Seabelo Senatla was the Top Try scorer of the series, scoring 66 tries. The Fiji 7s team scored the most number of points this season with 1,704 points. They also scored the most number of tries with 265 tries. Meanwhile, the New Zealand 7s team had the most number of yellow cards this season. They received 17 yellow cards. Fiji received 14 yellow cards this season.